Royal York Dental gives the gift of healthy smiles as part of a dental charity in celebration of National Oral Health Month. Royal York Dental gives the gift of healthy smiles in celebration of National Oral Health Month. During the month of April, the team at Royal York Dental participated in the Give Back Smile Back program by donating their time and dental services to local families in need of oral health care. Located in Kingsway Village, the dental office is home to 21 team members who are committed to supporting the oral health of their local community. Dentist Dr. Milica Stamenkovic, explains the importance of maintaining your oral health for life. 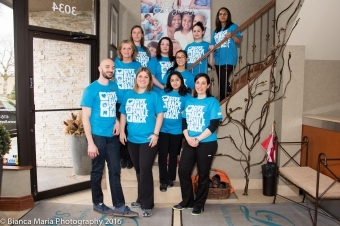 On Saturday, April 2, 2016, Royal York Dental opened its doors to provide dental care for individuals from the Rathburn Area Youth (RAY) program, a product of Lakeshore Community Health Centre (LAMP). The program was further extended to support women from the Humewood House, a local resource centre for young pregnant and parenting women. Dr. Elias Fahed and Dr. Jessica Aiello, also dentists at the practice, explain the importance of giving back to the community. “Oral Health Month is a great time to bring awareness to the issues surrounding oral health," says Dr. Fahed. "Give Back Smile Back is a wonderful opportunity for us to support the smiles of our community by offering our services to those who do not have regular access to dental care,” adds Dr. Aiello. National Oral Health Month is organized by the Canadian Dental Association and supports the promotion of good oral health across the country. Here are some tips provided by the team to help you maintain your healthy smile.